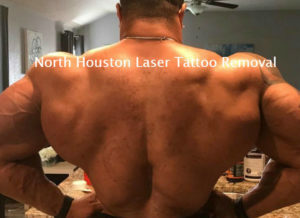 Competitive Bodybuilders need to show off the work they have done to build a very defined body and in competitions a large tattoo can get in the way of showing of the details in their back muscles and other parts of the body. 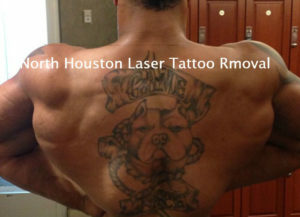 “Visiting North Houston Tattoo Removal was one the best decisions I’ve ever made. I got my tattoos when I was younger, not knowing I would choose to be a competitive bodybuilder later in life. I noticed that when I would compete, the tattoos would cover up the true definition my body had. Well, North Houston Laser Tattoo Removal took care of that problem!! Extremely professional and clean facility. My tattoo was completely removed with no scarring at all. It made a huge difference for me when it was time to compete again!!. Definitely will be returning to have them remove the remaining tattoos. If tattoos are the marks of an era — declarations of love, of loss, of triumph, of youthful exuberance or youthful foolishness — then tattoo removals are about regret, confessions that those landmarks are in the past. They’re about the realization that whatever you believed in with such force that you wanted it eternally branded on your skin is now foreign to you. According to the Pew Research Center, more than 40 percent of Americans between the ages of 26 and 40 have at least one tattoo. Getting a tattoo, once the province of sailors rather than suburbanites, is so mainstream that tats are inked at the mall and seen on everyone from Middle American mothers to H Street hipsters to Hollywood starlets. Perhaps not surprisingly, a parallel trend is emerging: tattoo removal, with dozens of businesses and training schools opening across the country. You will be asked to fill out some basic paperwork regarding your general health and some questions that will help us determine what skin type you have. After the paper work is assessed we will discuss the procedure and go over any other questions that you might have. 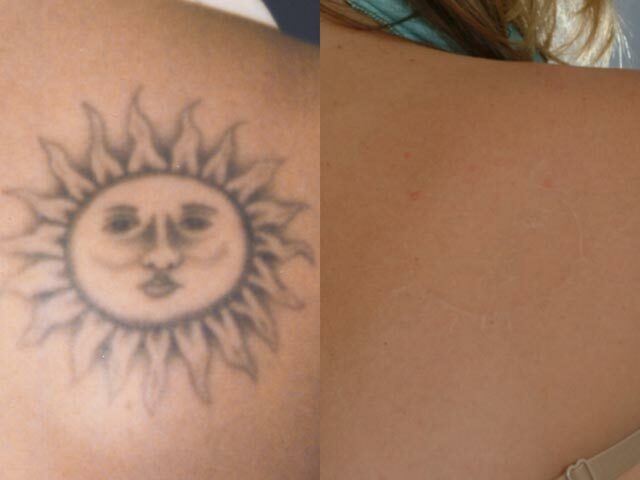 Next Step is that we will take some photos of your tattoo so we can track your removal progress. Then we will start cooling the area to be treated with the Zimmer Cryo unit, you can do this yourself it the site of the tattoo allows this. Sometimes if the customer holds the cooling hose it can help take your mind off the laser treatment. After treatment, our staff will evaluate your tattoo and then apply some antibiotic ointment and place a bandage over the tattoo. Then we will go over the after care instructions and give you a copy of the instructions as well. In 4-5 weeks, once your skin has completely healed you will come back for your next session where the process is the same..